THE GEAR: Jersey: Troy Lee Designs SE Pro, Pants: Troy Lee Designs SE Pro, Helmet: Troy Lee Designs SE4, Goggles: EKS-S, Boots: Gaerne SG-12. Q: FIRST AND FOREMOST, IS THE 2019 SUZUKI RM-Z250 BETTER THAN THE 2018 RM-Z250? A: Yes. The 2019 RM-Z250 is better than the 2018 RM-Z250 because the powerplant is better. It is no longer the weakest bike in the lineup, which means a lot considering the huge deficit in power the RM-Z250 had just 12 months ago. For the rest of the package, we think Suzuki spent more time making a good-looking bike than developing a proficient chassis and suspension settings. Q: WHAT HAS BEEN CHANGED ON THE RM-Z250 FROM 2018 TO 2019? A: When the details were first released about the 2019 RM-Z250, we were confused. Suzuki didn’t mention anything notable about the engine, but we heard rumors there were big changes coming down the pipeline. When the engine arrived, looking identical to last year’s, we thought Suzuki had just upgraded its motif and plugged the old RM-Z250 engine into the updated 2019 RM-Z450 frame. Not so! Suzuki updated both the engine and the frame. Here is the list of changes from 2018 to 2019. (1) Frame. Both cast and extruded sections were used to build the updated frame. It is 0.8 pounds lighter and has a 10-percent increase in torsional rigidity. (2) Forks. Suzuki switched from the Kayaba PSF-2 air forks to its coil-spring option. 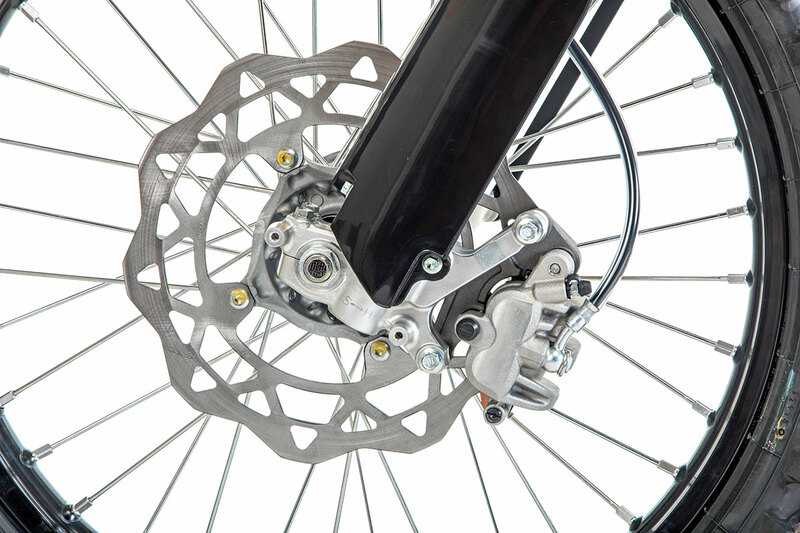 (3) Front brake. The RM-Z250 gained competitive pucker power by upping the rotor size to 270mm. The brake pad material and lever have been changed as well. (4) Swingarm. 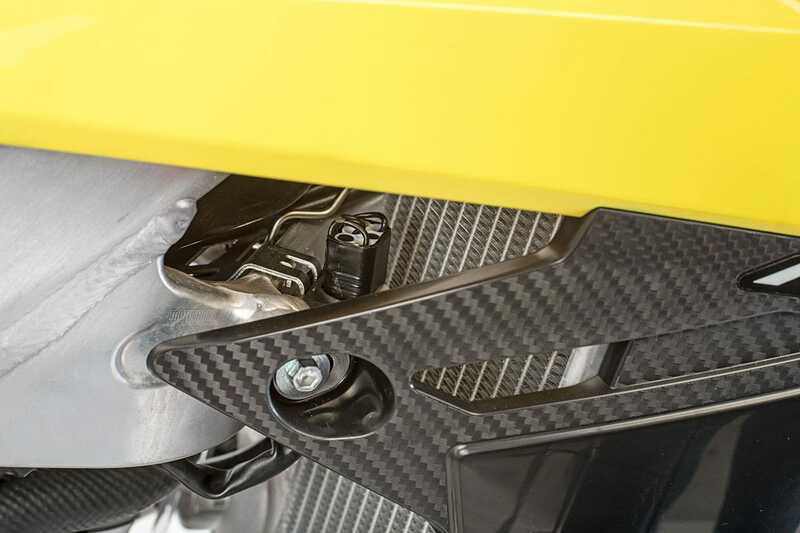 The swingarm lost 0.6 pounds due to a cutting-edge hydro-forming process. (5) Subframe. The subframe now has aluminum hexagonal rails that are moved inward and raised to allow more room for a larger filter. It is lighter as well. The 2019 RM-Z250 powerplant is much better than last year. It is easy to ride and has more power everywhere. (6) Shock. The Kayaba shock spring and link lost a pound for 2019. (7) Rear master cylinder. It has been redesigned to be sleeker so the rider’s boot doesn’t touch it when riding. (8) Wheels. The D.I.D. DirtStar rims have a new cross-section to reduce unsprung weight. (9) Tires. The tires have been switched from the Dunlop MX52 to the new MX33 front and rear. Much better choice. (10) Footpegs. The footpegs are the same, but they have been moved 0.12 inches forward and 0.2 inches upward. (11) Fuel tank. The tank is less than 1/10 of a gallon smaller but weighs 1/2-pound less. (12) Seat. The new seat is slimmer and weighs a 1/2-pound less. (13) Engine. The engine offers a new cylinder head that features a new intake port shape and finish. The intake cam profile has a more aggressive profile. The engine position in the frame has changed so the crankshaft sits higher in the chassis. (14) Airbox. The air cleaner opening is 30-percent larger to flow more air. (15) Dual fuel. The dual-fuel injection system is a Suzuki first (borrowed from Kawasaki). The primary injector is located at the bottom of the throttle body and sprays fuel at the butterfly valve. The second injector is in the air-cleaner inlet duct. (16) Cam chain. The cam chain tension adjuster and guide have been updated to reduce friction. (17) Piston pin. The machining process of the piston pin hole has been changed to reduce stress at the piston crown. (18) Gear ratio. Its second gear and overall final ratios have been changed in the five-speed transmission. Q: WHAT DO WE THINK OF THE UPDATED ENGINE? A: The only problem we had with the old engine was that it was slow. That may not sound like a compliment, but it is. 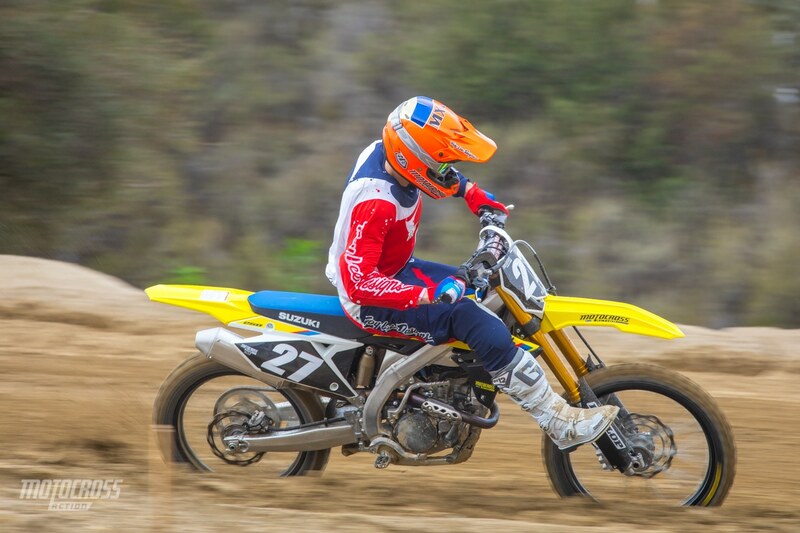 The old RM-Z250 engine offered an easy-to-ride powerband. It offered superb bottom-end power and was a great engine for entry-level riders. Most MXA test riders enjoyed the powerplant, but for those who lined up against the green, white, orange, red and blue competition, the enjoyment factor went out the window when it couldn’t keep up. What the engine lacked was serious pony power. The RM-Z250 engine of 2018 was more trail-worthy than race-worthy. For 2019, Suzuki spent the money required to dig the bike out of a hole it had been stuck in for years, and they succeeded. 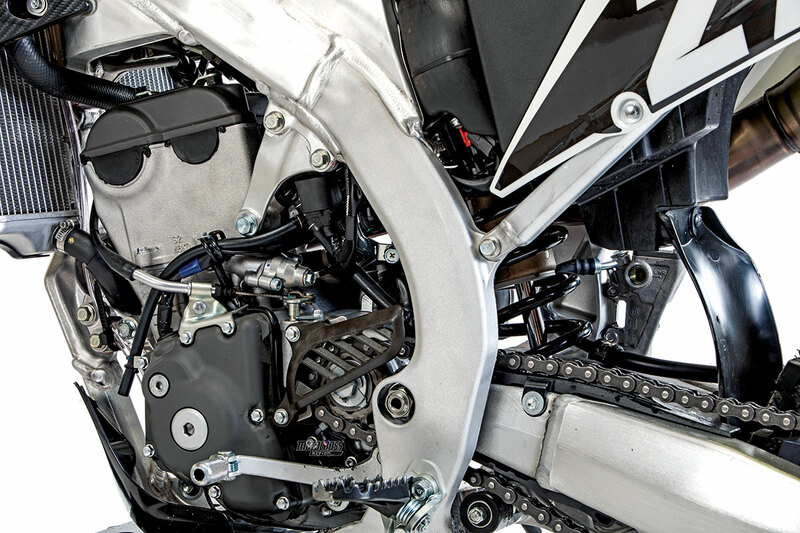 The 2019 RM-Z250 engine is good enough to play in the big leagues. It is not the 2019 MVP, but it deserves recognition. For the first year in a long time, it does not produce the least peak horsepower in its class. That spot is now occupied by the 2019 KX250. The 2019 RM-Z250 powerplant offers more power across the board. With the 2018 engine, you would need to short-shift as the power went flat just after the midrange. For 2019 you can feel the pull as you rev out the engine. The added thrust leaves you in a better position and with more momentum than the old engine. Its best feature is still its bottom-to-mid grunt, but now it offers enough top end and over-rev to make it a compete package. Still, even though Suzuki’s engineers took a big step forward with the power output of the 2019 RM-Z250 engine, they still have a long way to go. To be the MVP, the RM-Z250 needs to bridge the 3-horsepower gap to the 2019 KTM 250SXF (without losing its solid low-to-mid power). We think concrete got into the new RM-Z250 forks. Q: ARE THE NEW KAYABA COIL-SPRING FORKS ANY GOOD? A: No. 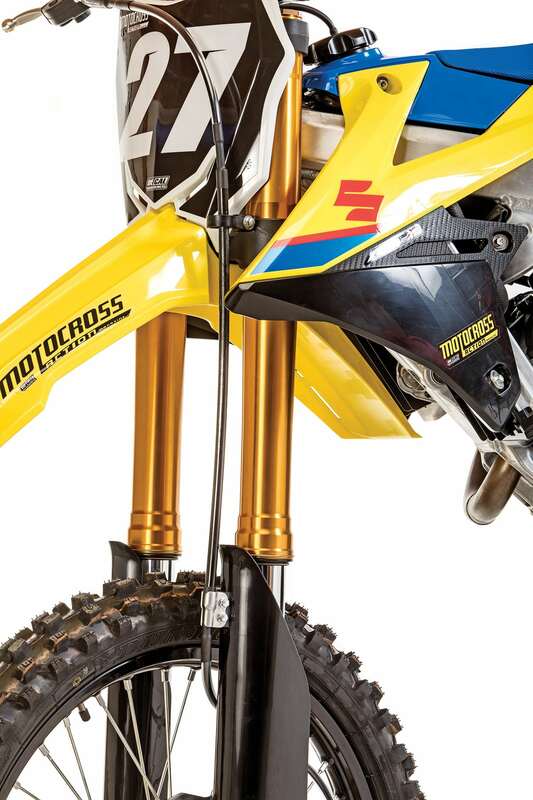 We don’t understand Suzuki’s logic with the 2019 forks. They are Supercross-stiff. This is the third time Suzuki has made this mistake in the last decade. Back in 2014 and 2017, the RM-Z450 forks had concrete in them. The new Kayaba coil-spring fork settings are horrible. Don’t mistake the bad settings for the Kayaba components themselves. They are good, if not great, components. Suzuki just botched the settings. An experienced suspension tuner can turn these forks around with no problems. We learned by trial and error that the big kink in the settings was Suzuki spec’ing too stiff a spring rate both front and rear. Once we dropped the fork and shock springs down a notch, the bike handled much better. Once test riders were able to use most of the travel, the RM-Z250 became more enjoyable to race. Q: WHAT COUPLER DID WE USE? A: The Suzuki still comes with easy-to-use, plug-in fuel couplers that change the engine mapping. The white coupler is the most aggressive off the bottom and gets the rpm to rev through their range faster. The grey coupler runs a bit rough. It offers a smooth, easy-to-ride throttle response as it picks up slower off the bottom. All of MXA’s test riders liked the white coupler best. Q: IS THE RM-Z250 STILL A TURN-AT-ALL-COSTS CHASSIS? A: More so than ever. The updated chassis has placed even more emphasis on the front end. This isn’t necessarily a bad thing, but with the stiff forks, we knew that we needed to work on the balance of the chassis. The most obvious fix would have been to put less race sag in the rear shock to put more weight on the front end. Sadly, weighting the front end made the chassis feel schizo. It was too quick on one hand and didn’t really help with the stiff forks on the other. So, we went in the opposite direction. Surprise! The chassis balanced out at 107mm of race sag on the shock. That much sag should have hurt the RM-Z250’s cornering prowess, but instead it enhanced it. Q: HAS THE PUCKER POWER BEEN BROUGHT INTO THIS CENTURY? A: Yes. The bigger 270mm rotor is on par with the other Japanese bikes’ rotors, although not comparable to KTM 250SXF or FC250 brake standards. Q: WHO IS THIS BIKE BUILT FOR? A: The 2019 Suzuki RM-Z250 is built for an entry-level, Novice rider of small stature. The cockpit is more compact than its competition’s, making it tailored to shorter riders. Its engine is incredibly easy to ride, and the power is manageable. Unfortunately, Suzuki mixed up Weston Peick’s spring rates and valving with the shim stacks that should have been put in the 2019 components. The Kayaba suspension components will need to be massaged by your favorite suspension tuner, especially if you’re in what would normally be the target weight of a 250 four-stroke rider. 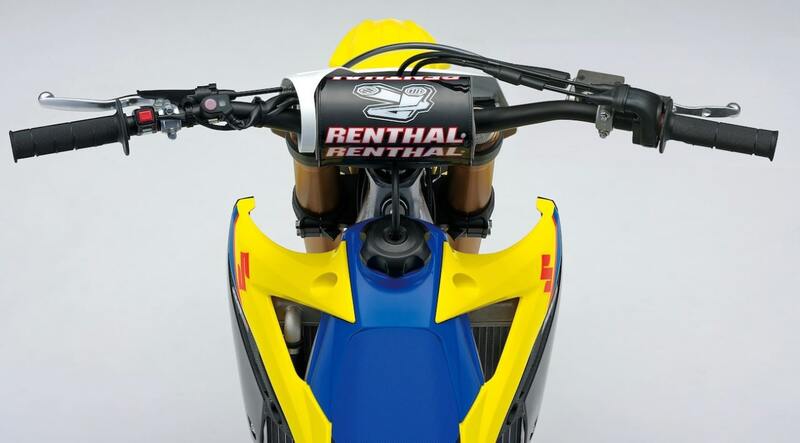 The RM-Z250 has three different maps to choose from by switching out the couplers that come with the bike. (1) Clutch. At the lever, the clutch has an easy pull that everyone loves. Unfortunately, the friction plates need to be replaced frequently, especially if you are a clutch abuser. Put stiffer clutch springs in to offset the cost. (2) Forks. The forks are set up for a 300-pound defensive lineman. (3) Transmission. The gears are notchy when shifted with a load. (4) Launch control. This is a dummy switch. If you’ve never started on dirt before, then you will need this. If you have, it is useless on an under-40-horsepower 250 four-stroke. Don’t let the salesman tell you any different. (5) Weight. This bike is heavy in the electric-start world. Imagine how heavy it would be if it had one. (6) Electric start. What e-start? (7) Vibration. This bike vibrates more than any bike in its class. Suzuki finally brought their pucker power into this decade going to a bigger 270mm rotor. (1) Cornering. This is the best-cornering bike in its class—once you find its harmonic balance. It gets in a corner with ease and stays there. It doesn’t oversteer or want to stand up in the middle of the corner. (2) Engine. This is a great low-to-mid engine. (3) Durability. In the past, Suzuki has had some serious durability issues. 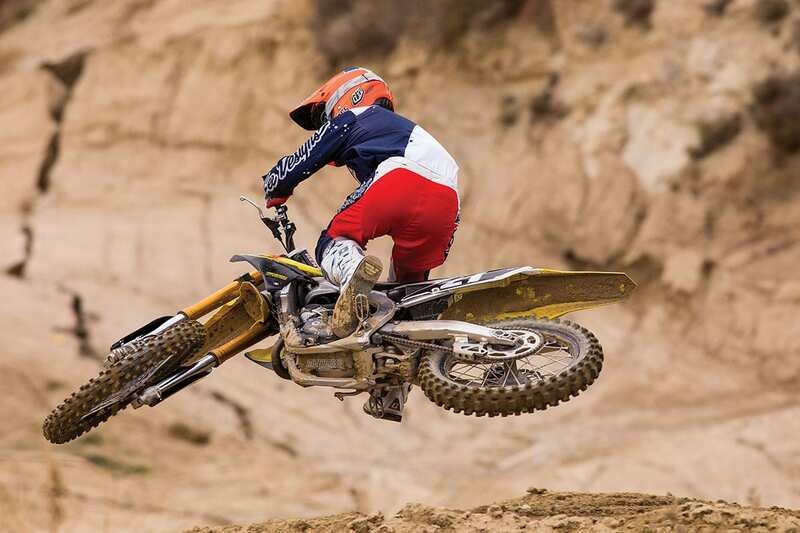 Over the last few years, we have had no catastrophic issues with the RM-Z250. (4) Tires. 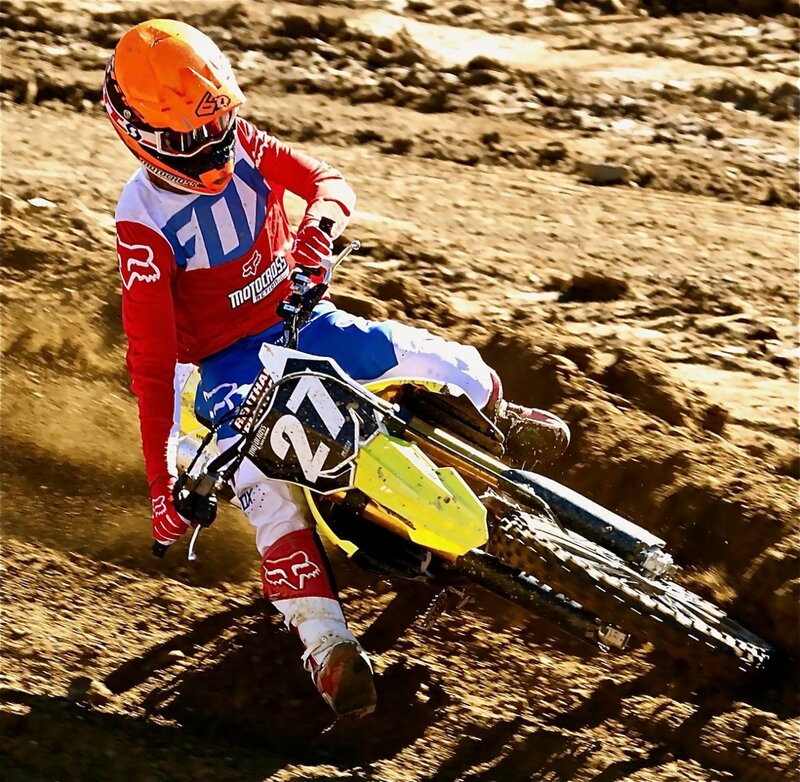 We like that Suzuki switched from the Dunlop MX52 to the MX33 tires front and rear. They are much better all-around tires. The shock’s valving is nothing like the forks as it actually moves, but the spring arte could come down for the typical weight of a 250 rider. 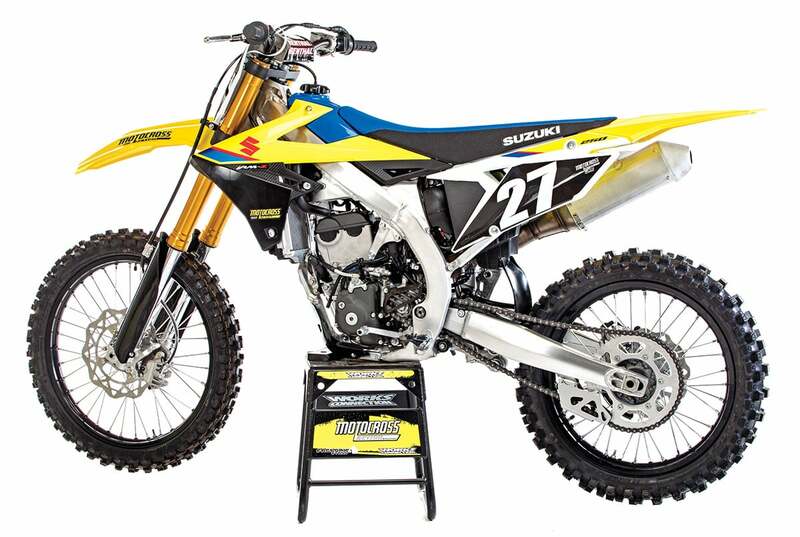 A: We applaud Suzuki for putting the RM-Z250 back on the map. It is one of the best-dressed bikes of 2019. It is a decent bike—if we turn a blind eye to the horrible forks. We admire Suzuki for taking a leap forward. 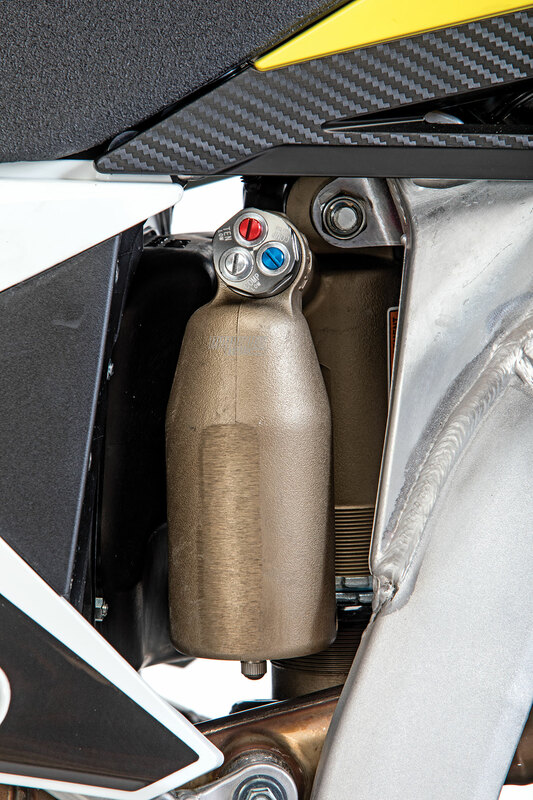 In the big scheme of things, it may have only been a small step for motocross mankind, but it is a giant step for the normally comatose Suzuki R&D department. The downside is that Suzuki allowed itself to fall so far behind that, after years of neglect, the R&D department’s hard work was not enough to bring the bike in line with the KX250, CRF250, YZ250F, 250SXF or FC250. 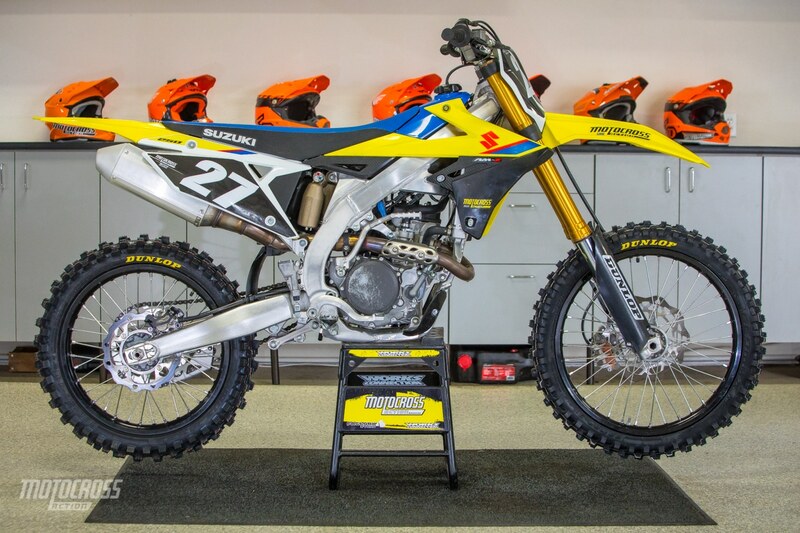 For the RM-Z250 to rise in the ranks, it needs to add electric start, lose 8 pounds, spec the correct spring rates and find 4 more horsepower (at least). This is how we set up our 2019 Suzuki RM-Z250 for racing. We offer it as a guide to help you find your own sweet spot. Notes: If you opt out of lowering the spring rate, then you will want to run the compression all the way out and drop the oil height by 20cc—unless you are a 200-pounder.